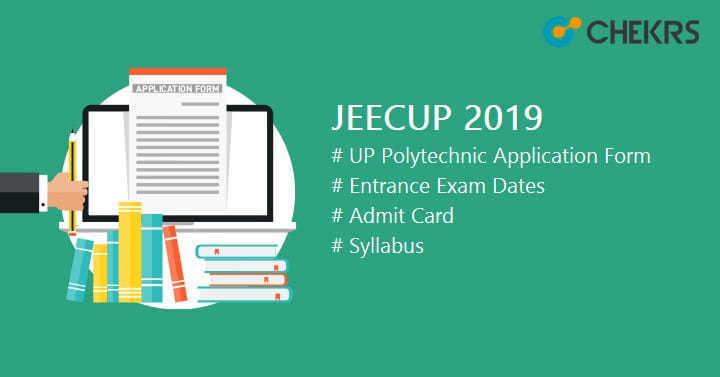 JEECUP 2019: JEECUP stands for Joint Entrance Examination Council of UP. JEECUP is a state level polytechnic entrance examination conducted by Uttar Pradesh Board of Technical Education (UPBTE). Latest Update: JEECUP 2019 Exam Date Announced!! Exam Will be conducted on 28th April 2019. It is being conducted to provide admission into Polytechnic diploma, PG diploma and post diploma Courses in the field of technology & engineering, and management. UPBTE conducts JEECUP every year to fill the seats in diploma institutes/ colleges of state UP. In this article, we will provide all the must-know details of JEECUP 2019, and process to fill JEECUP Application Form. JEECUP 2019 tentative dates are given below in the table. JEECUP 2019 Important Dates will be released with the official notification. So we will update this table with the official dates and events. Candidates have to fulfill all the eligibility criteria to fill the Application form. All the Eligibility criteria are listed below. Having Indian nationality, and must be the citizen of state UP. Candidates must have a minimum 14 years of age. All the candidate must be passed the minimum higher secondary or any equivalent course. Diploma in Engineering & Technology Passed or appearing in the 10th or equivalent exam with minimum 35% marks. Agriculture Engineering Passed or appearing in 10th or 12th with agriculture with minimum 35% marks. Diploma in Pharmacy Passed 10+2 examination with science stream with 50% marks for general/OBC ( 45% marks for SC/ST). Post Graduate Diploma course Graduate or appearing in the final year of any discipline. Diploma in Aircraft Maintenance Engineering Passed or appearing in the 12th exam with minimum 50% marks in Physics, Chemistry and Math subjects. The Application form will be available through online mode candidate will have to go the official website to fill the application form. The UP Polytechnic Application Form will be not available through any other mode. Candidate must have to full fill the required eligibility criteria because wrong and inappropriate entry lead to cancellation of the Application Form. Find the link for New JEECUP 2019 Registration. Now find the link for JEECUP 2019 application form. Fill all the asked (Personal/ Educational/Contact) details and submit it. Now Pay the JEECUP 2019 Application fee and finally submit it. JEECUP Application fee can be paid through debit card/ credit card, net banking or e-challan of SBI bank. The JEECUP Application Fee is Rs. 300/- for general and OBC candidates. To prepare better you will need JEECUP Exam Pattern and Syllabus, So we are also providing both here. In the JEECUP 2019 Syllabus, subjects of 10th and 12th will be considered. The Syllabus will be released on the official website. So candidates are advised to check and match the syllabus. The JEECUP Engineering syllabus will have mathematics, physics and chemistry subjects. While for Diploma in Pharmacy, syllabus will be compiled from physics, chemistry and biology/ mathematics subjects. Divide time for each subject. Manage Time Properly. Make your own notes, follow concepts & formulas. Take the help of reference books and JEECUP Previous Year Question Paper. Be consistent, Work Hard, eat well and do regular practice. The admit card will be also available through Online mode means on the official website. Candidates have to log in to the official website and access the JEECUP Hall Ticket. Candidates have to keep the admit card till the end of admission process. They will also need Admit card at the examination center. Answer key will be also released after the exam. It will be released in between 10 days after the exam. JEECUP 2019 Answer key will be released on the official website. To access the answer key, candidates need to access the website again and find the link for relevant answer key. After downloading the answer key candidates need to match their response with the answer key and so they can calculate their marks also. JEECUP Result 2019 will be released on the official website. To access the Result, candidates need to access the Official website and find the link for relevant Result. Now enter asked details and press the submit/ check result button. Your result will appear on the desktop. Save it. The authority will also prepare a JEECUP Merit List, On the basis of Merit list qualified candidates will be called for counseling. After the result and merit list candidates will be informed for counselling. In this JEECUP Counselling process, candidates will fill their preferred choices. It is an online process. After filling and submitting the choice, JEECUP Seat allotment procedure will be done on the basis of JEECUP Exam Result, Reservation, category, Seat availability. In this process candidates also have to bring all the required documents for verification. After successful verification and seat allotment candidates have to report to the allotted colleges for the further JEECUP Admission procedure.